The personal flying machine by NUS students. Eight engineering students from Singapore recently unveiled what could be the world's very first successful flying car. The current prototype of the personal flying machine can lift a 70 kg person and can be airborne for five minutes. The student inventors, who hail from the National University of Singapore, call their creation, the Snowstorm. It took the students one year to come up with a working, flying prototype of the electric-powered vehicle under the supervision of FrogWorks, an entity composed of NUS Faculty of Engineering's Design-Centric Program (DCP) and the University Scholars Program (USP). The students are from different fields of engineering such as computer engineering, electrical engineering, and mechanical engineering. The Snowstorm has a total of 24 motors, that each drives a propeller of 76cm in diameter. Made of high-grade material, the frame is composed of anodized aluminum beams, carbon fiber plates, and tubes with Kevlar ropes. The electric-powered aircraft is capable of vertical take-off and landing. The team admits that it is still a long way for their creation to be a form of transportation. The most practical use of the invention would be for personal recreational use to be flown indoors. The pilot, which sits at the center of the craft, has full control of the machine that has the same basic control features as most current AUVs. As a precaution, the team built a separate control that can be used on the ground in case on-board controls fail. Project supervisor Dr. Joerg Weigl expressed his insight, "A common trope in popular science fiction is the projection of humans flying on our own - think the Jetsons, or even Back to the Future. 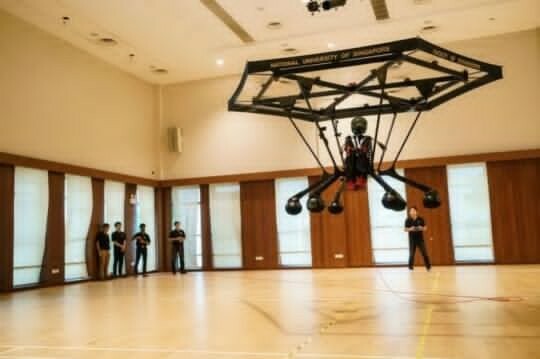 NUS' Snowstorm shows that a personal flying machine is a very real possibility, primarily as a means to fulfill our dreams of flying within a recreational setting." One of the project's supervisors, Associate Professor Martin Henz of the University Scholars Program and the School of Computing at NUS, credits the recent advances in motors and battery technology as the key foundation of their success. Aiming for future commercialization, he said, "The NUS team will continue to fine-tune Snowstorm, working on mechanical safety measures, propeller, and motor configurations, and control software and hardware to achieve the high levels of safety, simplicity and performance required for recreational use by the general public."